If you are like most patients, your answer is less than ten. Why? What about your smile would you change? And why haven’t you yet? Is it a misplaced tooth or stains that won’t go away? Do you have a “gummy” looking smile or short looking teeth? Or maybe it is a gap right in the middle? If you are unhappy with how your smile looks, now is the time to do something about it. 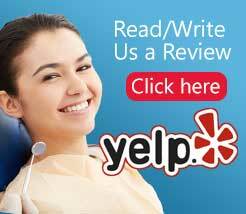 Have you always wondered about cosmetic dentistry, but thought maybe it wasn’t for you? Well, veneers are your answer! Veneers have come a long way. 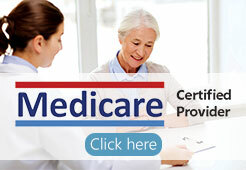 They are easy, painless and virtually instant. In a little as two visits you have an entirely new smile, or just enhance the one you already love. A veneer is a contact-lens-thin custom made shell that covers the front side of the tooth and is bonded on permanently. They are created one-of-a-kind in a laboratory just for you, by a technician from exact models of your mouth taken by the dentist. There is no reason to live with gaps in your front teeth, stains that won’t come off or crooked and misshapen teeth. Today a veneer placed on top of your teeth can correct natures mistake or remove the results of an injury, leaving your teeth looking better than ever and refreshed. At least once a week I get asked if we do Lumineers. And my answer is YES! Not only does our office do Lumineers, but also many other kinds of veneers. Lumineers are just one type of veneer that our office offers. They are one of the most publicized types of veneers, however there are many options to fit your dental problem. 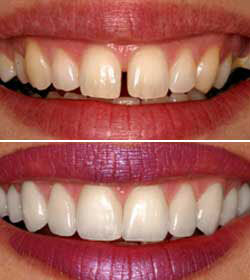 Veneers require little, if no drilling, no shots, and no large time commitment, with gorgeous permanent results. Many times patients think cosmetic dentistry means an unnatural, movie-star smile. They think cosmetic dentistry is not for them because they might not feel like “themselves”. These days this is not the case. Results can range from drastic, to subtle. With a variety of custom shade, size and shape options, you can get exactly what you want. 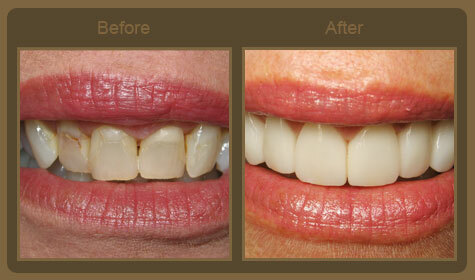 Veneers are one of the easiest and fastest ways to change your smile. Whether you looking for a dramatic or subtle result, veneers can deliver both. I would love to talk over your options at your next visit. Feel free to ask about the variety of Before/After photos we have in our office.